Library of Congress. Via Wikimedia Commons. Imphal (93.944E 24.81N) is located in a large, fertile valley in the midst of the Manipur Hills of east India. Bordering on Burma, the city became the objective of a Japanese invasion in 1944 that was turned back with catastrophic losses. In 1941 Imphal was a cluster of villages amidst plantain and bamboo groves, and was ruled by a native prince. The surrounding plain was partly occupied by shallow, swampy Logtak Lake. The population was mostly Hindu, but about 10% were Muslims, and there was a significant population of nomadic Kukis and more settled Nagas. A few of these were Christians. There had been no significant disturbances in the area since a rebellion in 1891. Imphal is located in a relatively isolated area, with just four roads to the outside world. The most important road led north through a deep valley in the Naga Hills (5000' or 1500m elevation) to the village of Kohima, and from there to the railhead at Dimapur. A more difficult route, the Tiddim Road, led south through the Manipur river valley in the Chin Hills (up to 9000' or 2700m elevation) to Burma. This route was used by British forces retreating from Burma in 1942, and again by Japanese forces during the 1944 invasion. Smaller roads lead east to Silchar in Assam and west to Tamu in Burma. The latter was also used by the Japanese in the 1944 invasion. The British expended considerable effort to improve the Tiddim Road in preparation for their counteroffensive into Burma. This proved nearly impossible, since the terrain in the Manipur Valley was extremely unstable and roadbeds tended to dissolve into mud with the slightest rain. One particularly problematic stretch of about seven miles (11 km) had forty switchbacks and was known as "The Chocolate Staircase". The solution finally arrived at was to construct traditional Indian brick kilns along the road and build up the roadbed out of millions of kilned bricks. The surrounding plain had a number of airfields by 1944,of which the most important were the all-weather fields located just northwest of Imphal and at Palel near the foothills at the southeast end of the plain. The Palel airfield would prove vulnerable to Japanese commando-style raids and its surface would begin to break up under heavy C-46 traffic, forcing the British to conduct most of their operations during the battle of Imphal out of the Imphal airfield. Slim planned to defend Imphal with the 17, 20, and 23 Indian Divisions of IV Corps (Scoones). 23 Division was exhausted from months of operating in the Chindwin Valley and was short 5000 men from its normal strength of 17,000, and had been pulled back to Imphal. 17 Indian Division was strung out along the road south from Imphal to Tiddim, while 20 Indian Division was concentrated in the Tamu area southeast of Imphal (94.31E 24.22N). Both of these divisions would be ordered to pull back and dig in around the Imphal Plain once it was clear the Japanese offensive had begun. The three divisions would then live off the same depots that were the target of the Japanese attack, supplemented by air transport. Slim expected the strongest Japanese thrust to come from the south, since the approaches here were more favorable to movement of tanks and artillery, while the attacks from the southeast and northeast would have to cross much more difficult country. Slim planned to parry any stroke from the northeast with 49 Indian Brigade, which was positioned at Shangshak (near 94.34E 25.05N). Kohima was covered only by 50 Indian Parachute Brigade and line of communications units, but Slim incorrectly assumed that the Japanese could not throw more than a regiment against the town. Tiddim Road. The British expected the Japanese offensive to begin on 15 March 1944, but what their signals intelligence had intercepted was the date for 15 and 31 Divisions to cross the Chindwin. 33 Division and 14 Tank Regiment began moving out of Fort White (93.78E 23.23N) on 8 March 1944, with 33 Division headquarters leading 214 and 215 Regiments in three columns towards Tiddim. At the same time, the infantry group commander, Yamamoto Tsunoru, led a column up the Kabaw Valley towards Tamu. The main body of 33 Division attempted to cut off 17 Indian Division with a double envelopment aimed at the bridge across the Manipur River at Singgei, just northwest of Tongzang. Not far off, at Milestone 109, was a huge supply dump. Caught off guard and too far forward, 17 Indian Division would have a difficult time extricating itself. 215 Regiment struck off left of the road to come at Singgei from the west, and though it was spotted by a patrol of 63 Indian Brigade, the Japanese soon were attacking the two battalions covering the bridge. Alarmed, Scoones sent a machine gun company to cover the dump, with 37 Indian Brigade and 254 Indian Tank Brigade from Imphal close behind. He would later order 49 Indian Brigade south as well, sending 50 Indian Parachute Brigade to take its place and leave Kohima almost naked. By 13 March the magnitude of the Japanese offensive was becoming clear. Mountbatten had previously appealed to the highest command levels for the use of additional transport aircraft for the Arakan and for the Chindits, and found that approval came only after much delay and a lecture from Roosevelt that he was not to divert aircraft from "The Hump" again. However, faced with an emergency at Imphal and backed by Sultan and Stratemeyer, he was able to commandeer the transports. 5 Indian Division, fresh from repelling the Japanese counterattack in the Arakan, began to be flown in, with 161 Indian Brigade arriving at Dimapur by 20 March. The Japanese bid to pin down Slim's reserves with Ha-Go had failed. The airlift, codenamed STAMINA, delivered 12,561 troops and 18,824 tons of supplies and evacuated 13,000 casualties and 43,000 noncombatants by the end of June. Cowan was ordered to pull 17 Indian Division back to Imphal on 13 March, but by the time the main body of 17 Division arrived in Tongzang, the village was under attack by 214 Regiment and the Japanese had blocked the road further north. However, the British were able to bring in supplies by air as air strikes hit the Japanese positions, and by 16 March the Japanese battalion blocking the road had been shattered and 17 Indian Division was able to continue north. The defeat at Tongzang had repercussions far up the Japanese chain of command. Disheartened, the commander of 214 Regiment relaxed his grip on the road, and the commander of 33 Division, Yanagida, radioed Mutaguchi that Imphal could not be taken before the monsoon set in. Mutaguchi sent back a blistering reply ordering him to continue the attack, and began to operate the division through Yanagida's chief of staff. Slim described the situation on the Tiddim road as "a Neapolitan ice of layers" (Allen 1984) with Japanese and British forces alternating along the road. However, the bridge across the Manipur had been held and the headquarters of 17 Indian Division was across by 17 March. The depot at Milestone 109 was captured by the Japanese, then recaptured by the British on 25 March with most of its supplies still intact.On 26 March the last of 63 Brigade was across the bridge and it was demolished behind them. 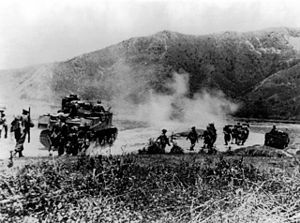 The British cleared the last Japanese roadblock on 2 April and 17 Indian Division was safely back to Torbung at the edge of the Imphal Plain by 4 April. By this time the pursuing Japanese had suffered 50% casualties, and they would not reach Torbung until 6 April. That the two Japanese regiments did as well as they did against four British brigades with overwhelming air support reflects the sluggishness of the British reaction. Cowan was slow to begin his retreat, Scoones was slow to deploy his reserves, and even Slim was slow to shift his strength from the Arakan to Imphal. On the other hand, the Japanese were showing critical weakness in command and logistics. Yanagida now sent 214 Regiment through the hills west of the Imphal Plain in an attempt to cut off 17 Indian Division north of Bishenpur. A small raiding party from 215 Regiment struck deep into the hills to destroy the bridge over the Ilang River, which they accomplished on 14 April. This eliminated any possibility of reinforcements and supply coming up from Silchar in Assam. The British meanwhile pulled 49 Indian Brigade back into corps reserve and deployed 32 Indian Brigade from 20 Division at Bishenpur. Patrols from this brigade began encountering the Japanese in the hills to west beginning on 15 April, and barely got into position ahead of the Japanese on 16 April. The Japanese concentrated their artillery here and the British were forced to accept heavy losses in tanks to counter the Japanese guns. The Japanese pressed their attack on the British line along the Silchar trail, supported by fighters on the night of 24 April, and cut off a British battalion near Hill 5846. The isolated battalion and the Japanese exchanged sniper fire along the trail to the battalion's only water supply, and one British sniper later claimed 23 kills. Casualties on both sides were heavy: 215 Regiment lost around 500 killed or wounded and 214 Regiment lost 289 men, while one of the battalions of 32 Indian Brigade suffered 75% casualties. However, the Japanese could not break through to advance the remaining ten miles (16 km) to Imphal. Tamu Road. Yamamoto's column was a mixed force from 33 Division and 15 Division amounting to about four battalions of infantry and the division engineer regiment heavily reinforced with artillery and 30 light tanks. Their objective was Tamu and the road beyond, which led through the mountains to Palel at the edge of the Imphal plain. Additional elements of 15 Division crossed the Chindwin on 15 March to join Yamamoto in his attack. By 15 March the Japanese had made contact with 20 Indian Division, resulting in the only real tank on tank battle of U-Go, when a force of six British Lee tanks tangled with a roughly equal number of Japanese Type 95 tanks. The British lost one tank while the Japanese tanks were wiped out. However, the threat of 15 Division further north prompted Scoones to order Gracey to destroy the supply dump at Moreh and retreat to the Shenam Saddle (94.10E 24.40N) to free troops for redeployment against 15 Division. Gracey reluctantly complied, and 20 Indian Division began a skillful fighting withdrawal that inflicted serious losses on 33 Division and halted the Japanese advance at the Shenam Saddle. By the end of April, 32 Indian Brigade was in reserve at Palel and 80 and 100 Indian Brigades were firmly entrenched at Shenam Saddle. Gracey knew he could not completely cover 25 miles (40 km) of front and so he adopted a "box" defense with the gaps between "boxes" covered by aggressive patrolling. Over the next two months, the British and Japanese sparred back and forth across the hills, and the Japanese, now reinforced with an additional battalion of 15 Division fresh from fighting the Chindits and 2 INA Guerrilla Regiment, twice attempted to infiltrate through the hills north of the road. The first raid, on the night of 28 April 1944, failed when the INA commander invited the Indian Army pickets at Palel airfield to turn on their English officers, and the Indian Army troops responded by opening fire on the INA. The INA troops were hit with artillery the next morning and suffered 250 casualties. The second raid managed to reach Palel airfield and destroy several aircraft and supply depots before being driven back again. Shangshak. Meanwhile 50 Indian Parachute Brigade was fighting desperately to hold the northeastern approaches to Imphal. The country here was rugged and devoid of good roads, but it was the shortest path to Imphal from the Chindwin. Elements of 58 Regiment pushing towards the Kohima road were diverted against Shangshak by the 31 Division infantry group commander, Miyazaki, who was nervous about the presence of a British force flanking his lines of communication. The Japanese made their first attack on 18 March and a vicious, close-quarters fight developed. A night attack by the Japanese on 23 March was beaten back with heavy artillery support, but by 27 March the shattered 50 Indian Parachute Brigade was forced to withdraw. The victory was Pyrrhic for the Japanese. In addition to suffering heavy casualties, particularly among junior officers, they had been delayed a crucial week in reaching Kohima. More grievous still, the British had captured a copy of the Japanese battle plan, which tipped them off that a full division was headed for Kohima. Kohima. With 50 Indian Parachute Brigade committed to the fighting northeast of Imphal, Kokoda was defended only by a few units of rear area troops. On 27 March Slim was reinforced with XXXIII Corps (Stopford), which assembled at Dimapur before advancing on Kohima. By this time the second brigade of 5 Division was flown in to Imphal and the third brigade was detached to join XXXIII Corps. Only a single battalion of 161 Indian Brigade was able to reach Kohima before the Japanese surrounded the village, but the remainder of 161 Indian Brigade took up positions west of the village and provided badly needed artillery support for the defenders. The siege of Kohima was finally lifted on 18 April. Now the British went over to the offensive. Stopford had 161 Indian Brigade in the town itself; 7 Indian Division (Messervy) coming down from the north after having been airlifted in from Arakan; 23 Long Range Penetration Brigade in the Japanese rear interfering with Japanese supply lines; and 2 Division preparing to storm Kohima Ridge and reopen the road to Imphal. The battle was vicious and bloody. The Japanese had already built formidable bunkers throughout the areas they controlled, and had to be blasted out by tanks and artillery. Nothing short of a 5.5" artillery shell or a 75mm tank round fired at close range could take out a bunker. However, by 11 May the British held all of the Kohima area except for Naga village to the northeast and Aradura to the south. Nungshigum. Meanwhile, on 28 March, 15 Division cut the road between Kohima and Imphal at Kangpokpi ("The Mission", 93.968E 25.146N), and Slim's plan to resupply Imphal by air was no longer optional. However, 15 Division was soon in trouble. Understrength, with one regiment and most of its transport still in Thailand or fighting the Chindits, the division went into battle with just six understrength battalions and its commander, Yamauchi Masafumi, dying of tuberculosis. Most of its artillery and almost all its antitank weapons had to be left behind, though Naka, the Burma Area Army chief of staff, blandly assured Yamauchi that the British would have no tanks. 15 Division attacked in two columns. The column on the right advanced on Kohima from the west side of the Kohima-Imphal road while the left column advanced on Imphal from the north.The left column had reached the hills overlooking Imphal by 31 March. When a British tank reconnaissance turned back after having a few grenades thrown at it on 1 April (April Fool's Day), Yamauchi rashly concluded that his lack of antitank weapons would be no problem, and he ordered an advance on Kameng, at the edge of the Imphal Plain on the road from Ukhrul to Imphal. Hill 3833, known to the British as Nungshigum (94.016E 24.916N), commanded the road from Imphal to Kameng, but the British could initially spare only two platoons to hold the position. These were driven off by a battalion of 51 Regiment on 7 April. A British company supported by Hurribombers retook the position only to be counterattacked repeatedly and finally driven off on 11 April. A full-blooded British assault supported by 16 Vengeance dive bombers, 8 Hurribombers, a squadron of tanks, and the massed artillery of 5 Division was staged on 13 April. The Japanese were astonished to find that British tanks could go up fairly steep hills, but the British began taking heavy casualties among the exposed tank commanders. The fighting became so intense that every tank and infantry officer on the British side became a casualty, while the Japanese battalion was annihilated and none of its surviving officers were left unwounded. A desperate Japanese counterattack that evening was driven off. Shortly thereafter the commander of 51 Regiment, Omoto Kimio, reported to Yamauchi that he was taking his entire force to attack Hill 4057 -- a position that was actually to the east of Nungshigum. It was a veiled way of requesting permission to withdraw in the face of British armor he was unequipped to cope with. Yamauchi considered Omoto his best regimental commander; he reluctantly gave permission. British control of Nungshigum stopped the Japanese advance on Imphal from Ukhrul and threatened the lines of communication of 60 Regiment on the Kohima-Imphal Road. The Japanese had reached their closest point to Imphal but had been turned back. British historians consider 19 April 1944 the turning point of the battle: Kohima had been relieved, 17 Indian Division had been extricated from the Tiddim road, and the Japanese thrusts from southeast and northeast had been stopped. By 28 April Mutaguchi himself was becoming pessimistic about the likelihood of Japanese victory, and the Japanese Army Vice Chief of Staff, Hata Hikosaburo, visited Rangoon on 30 April and returned to Tokyo on 11 May with a bleak assessment of the likelihood of success. But Tojo badly needed a victory and refused to call off the offensive. Kawabe also badly needed a victory. Hard-pressed in northern Burma by Stilwell and the Chinese, he visited Mutaguchi on 6 June 1944 and discussed redeploying 31 Division to the left of 15 Division for one last attempt to take Imphal from the northeast. This strategy tacitly accepted that Sato had already begun to retreat from Kohima. Although neither man voiced it, Mutaguchi recalled postwar that there developed an unspoken understanding between the two that the operation must be abandoned immediately, However, when Kawabe returned to Rangoon, he found messages awaiting him from Tokyo encouraging him to be patient, and he felt obligated to continue the operation. The Japanese Descent Into Disaster. On 10 May 1944 Mutaguchi had relieved Yanagida for cowardice. The new commander of 33 Division, Tanaka Nobuo, was shocked by the appearance of his troops, but was able to stir their morale sufficiently to resist the British counterattack of 2 June. Cowan had 32 Indian Brigade on loan from 20 Indian Division guarding the Silchar track and 63 Indian Brigade on the main road south from Bishenpur. The brigade had failed to eject the Japanese from Ninthoukhong, suffering 130 casualties and loss of three tanks in the attempt. Now Cowan sent 48 Indian Brigade on a long flanking move around Logtak Lake to cut Tanaka's supply line. On 18 May 48 Indian Brigade cut the road and turned north to roll up the Japanese. However, the other arm of the pincers, 63 Indian Brigade, was stopped by fierce Japanese resistance at Kha Aimol, though its seizure of Three Pimple Height cut communications between Tanaka and his forward regiments. 48 Indian Brigade was now isolated, and it was forced to fight its way back to the British lines at Bishenpur in box formation. Bypassing Ningthoukhong, the brigade was back in contact with 17 Indian Division on 30 May. Though the envelopment had failed, the British had inflicted a thousand casualties on 33 Division. Tanaka was simultaneously trying to cut Cowan's own supply line. 214 Regiment infiltrated through the hills and came out at Milestone 10 of the road from Imphal on 20 May. A single British platoon held on to the key ground overlooking Cowan's headquarters, and 50 Indian Parachute Brigade and two troops of tanks led a counterattack that drove the Japanese back into the hills by the end of May. By then the lead Japanese battalions were reduced to 40 and 20 men each. The Japanese were greatly hampered by the British positions on Three Pimple Hill, and Tanaka ordered 215 Regiment to take the hill. The first attack, on the night of 24 may, failed when the headquarters group were killed by a mine, and subsequent attacks were equally disastrous for the Japanese. By 23 May 33 Division had suffered a total of 3500 casualties from the start of the campaign. By now Tanaka was beginning to sympathize with Yanagida, the man he had replaced. Tanak's men a finally drove the British out of Kha Aimol on 7 June and Tanaka was able to regain contact with 214 and 215 Regiments. He was reinforced at about this time with 154 Regiment on loan from 54 Division in Arakan and 151 Regiment on loan from 53 Division in north Burma. 154 Regiment was sent to take Potsangbam, just south of Bishenpur, and managed to secure a foothold in the village, but got no further. 153 Regiment was to attack Forest Hill and Plum Hill west of Bishenpur. A commando-style raid was also planned on the artillery at Nunggang. The raid was successful, the attack on Forest Hill achieved surprise and drove the British off, but the Japanese could not capture Plum Hill. Another Japanese command-style raid penetrated to within four miles of Imphal -- their closest approach in the battle -- and destroyed some artillery, trucks and tanks before being driven off. By 30 June Tanaka calculated that his division had lost 7000 men as combat casualties and another 5000 from sickness, or about 70% of his division's authorized strength. Meanwhile Sato was being gradually pried out of Kohima. His men had been issued rations only sufficient to last through 5 April, and almost no additional supplies were getting through. Just two Japanese supply convoys carrying mostly artillery rounds made it to Kohima, and while Miyazaki had made a point of treating the Naga natives along his route of march well, so that they would willingly provide food to his foragers, almost none of this reached Sato at division headquarters. Most of the Nagas remained loyal to the British, and together with the Chindits, they put considerable pressure on Sato's lines of communication. On 17 April 1944, Sato had received an order from Mutaguchi to take Kohima by 29 April and then send three battalions to the Imphal front. Sato responded to the order with mokusatsu, contemptuous silence, but when the order was repeated he replied that it was impossible. On 25 May Sato was informed that all the available transport for 15 Army was committed to bringing reinforcements to 33 Division and there would be no supplies for 31 Division. Sato was determined to save his men from annihilation and signaled 15 Army that he was going to withdraw to a point where his men could be resupplied. When Sato received a farewell message from one of his regimental commanders at Kohima on 31 May he gave the order for the entire division to retreat. The arrival of the monsoon on about 27 May further increased the misery of the Japanese troops, along with their British adversaries. Sato was then ordered to take his division to join the Imphal front. Had a single regiment from his division been committed to Kohima, as Slim originally expected, and the rest deployed against Imphal from the beginning, Imphal might have fallen. Now it was too late. Sato arrived in the vicinity of Ukhrul on 21 June and found that the supplies promised him had been taken by 15 Division. Sato pressed on to Humine (94.569 24.681N) only to find that there was just two days' supply of rice there and no further supplies between Humine and Tamu. Sato set his men to foraging in the mountains to the west, but there were already beginning to be deaths from starvation. By 4 June Miyazaki was attempting a fighting withdrawal down the Kohima-Imphal road. Meanwhile 60 Regiment also began to withdraw from its positions along the road. The siege of Imphal was lifted on 22 June, when 2 and 5 Indian Divisions finally linked up along the road. Meanwhile Scoones had undertaken to destroy 15 Division. He had sent 23 Indian Division towards Ukhrul and 5 Indian Division up the Kohima road. 1 Indian Brigade raced for 15 Division headquarters at Kasom (94.226E 24.976N) and just missed catching the ailing Yamauchi on 15 April. Stubborn resistance in the hills east of Tanglatongbi (93.900E 24.983N) was finally overcome in early July as 5 Indian Division, 20 Indian Division, and 23 Indian Divisions split 15 Division and began to destroy it piecemeal. Meanwhile Yamamoto made one final lunge at Palel with two badly understrength battalions of 51 and 60 Regiments. A portion of the force was able to slip through the hills north of the Palel-Tamu Road and raid the Palel airfield. Raids on the nights of 2, 9, and 10 July destroyed at least eight aircraft, damaged several others, and set several munitions dumps and fuel depots ablaze. However, Yamamoto's attempt to follow up on the raids failed when the reinforcements simply refused to move forward. On 13 July Yamamoto was ordered to withdraw back to Tamu. Rations for his men were now down to 48 grams (1.7 ounces) a day. Ordered to hold Moreh until 31 July, Yamamoto replied "So far I have obeyed Army orders, but from today I move according to my own judgment" (Allen 1984). Yamamoto did not stop until he reached Sittaung on the Chindwin on 2 August 1944. On 10 July Sato, who was "on the rampage" (Allen 1984) trying to secure supplies for his division, was finally dismissed by Mutaguchi for withdrawing without orders. Sato demanded trial by court-martial, at which he intended to expose Mutaguchi's incompetence, but Kawabe had him retired on grounds of combat fatigue ("mentally disturbed under the stress of the acute war situation"). By now Kawabe had decided to end U-Go. The decision was made on 3 July and signaled to Mutaguchi on 5 July 1944. The Japanese forces were in very serious trouble, having failed to take the British depots and having little or no logistical support of their own. 31 Division was disintegrating; 15 Division was beginning to disintegrate; and 33 Division was trapped and would have to fight its way out. Mutaguchi bowed to the inevitable and acknowledged Kawabe's order on 9 July 1944. Although Mutaguchi tried to hold a roadblock on the road from Palel,the retreat turned into a rout in which thousands of Japanese soldiers perished from hunger and disease. Understrength and delayed in Thailand building a road from Chiengmai to Toungoo. 14 Tank Regiment Supporting 33 Division. Equipped with Type 95 light and Type 97 medium tanks. Supporting 33 Division. Also known, ironically, as the Gandhi Brigade.